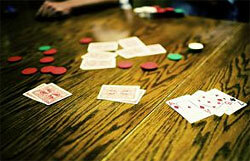 Pontoon casino card game is a famous blackjack variation. It is a variant of Spanish 21 blackjack game which is performed in Australia and Malaysia gambling houses. Regardless of your geographical location you may play Pontoon online variant with ease. This game is highly recommended for beginners and plus it possesses one of the lowest house edges. The dealer is the last one who plays his hand and he hits up to 17 points total obligatory. Playing in any online casino is a simple thing to master while using the Pontoon Basic strategy tables given below.